Making our clients happy is our primary goal. On this page, we answer all your questions related to the products and service we offer. We invite you to peruse the FAQs below and if you have a question we haven’t covered, please don’t hesitate to contact us. Please see our dedicated page for specific questions regarding collections points. And if you’ve just discovered us, our New Here? page provides a helpful snapshot of how things run at Border Park Organics. To jump to the new FAQs on CSA Membership, click here. Here are our eight most asked FAQs. Below these, you’ll find FAQs to a host of different related topics. How often do you have meat available for sale? You can find dates for our scheduled orders in our Calendar. We aim to provide meat each month (save January when we have a break!). Our collection dates are typically scheduled to be collected on the first Thursday or Friday in each ordering month. Please be aware that since the inception of our 2018 CSA Membership Program, there is now only a very limited amount of products left for public sale each month. If you are interested in joining our 2019 CSA Membership so you get priority of choice, please join our CSA mailing list and we’ll keep you updated. You may also like to subscribe to our newsletter that will keep you informed of our latest information. We offer multiple options! We have nearly 60 collection points in South Australia (we also deliver to Mildura in Victoria and Broken Hill in New South Wales). Please check carefully before you place an order to confirm that we deliver to your desired location on the order you select. Find your nearest collection point (including specific freight costs) on our interactive map on the Collection Points page. If you don’t see a location that is convenient for you to access, please email us and we will strive to make something work for you! When you submit your online order, you will be asked to create an account. You will also nominate your collection point. How do you charge for the meat? The price for our meat is per kilogram boxed weight (the actual amount of meat you receive). This means you are not paying for bones (unless included in your cuts) or fat trimmings. Please see the Pricing FAQs below for a list of our meat pack prices. 1. The first part is a deposit paid within 7 days of placing your order. 2. The second part is paid after you receive your order. In order to secure your order, you will be issued with an Order Number and required to pay a 50% deposit of the estimated total cost plus your anticipated freight cost. If you are paying by Bank Transfer (EFT) a confirmation email will be sent to you automatically advising you of the Direct Deposit instructions. Once your deposit has been received, you will receive an email confirming your meat order details, expected delivery date and collection point details. Your final payment is due after you collect your order. Your final payment amount is calculated when your order is packed and weighed. We then subtract your deposit from your total cost. The invoice for your final payment amount is sent to you within a few weeks of you receiving your order. If you are eligible for any freight reimbursements (for shared collection points), this refund will be applied to your final invoice. • delivered in lined cardboard boxes. For more details, see the topic Packaging below. Are your animals fed any grains? Our animals are not grain-fed. The only exception to this is in severe drought conditions. In this case, we will primarily look after the nutritional needs of our breeding stock, and may need to supplement their feed with grain. Livestock destined for meat sales are not intentionally fed any grain. However, if this is occurs, we will make this clear on our website. According to our organic commitment, we will not confine our animals to a ‘feed-lot’ situation. As seasons allow, we also aim to plant green fodder crops and crops to bale as hay in order to offer our animals variety and a continual feed supply. Our animals play a very important role in our weed management plan, in what has essentially become a symbiotic relationship with the cropping enterprise on the farm. Because of our belief in low-stress stock handling and their quiet temperaments, our cattle know us and our farm vehicles well. We know when they are ready to be moved to a fresh paddock for new feed because they walk towards us when we enter the gate, and then they lead us! The nutritional needs of our animals are met by natural pasture, and may be supplemented as needed with natural minerals and products such as liquid seaweed, apple cider vinegar, salt and gypsum. Community Supported Agriculture (CSA) is a partnership framework between producers and customers. We grow and care for the animals, and you receive a share of them at regular intervals. (Think of us as your own personal farmer who specifically tends your livestock). Ultimately, a CSA helps connect eaters more closely to the farm and knowledge of food production. The earliest model of Community Supported Agriculture (CSA) first appeared in Japan in the mid-1960s, and it has quietly gained momentum worldwide over the last 20 or 30 years. Why is a CSA so helpful for the farmer? By adopting a subscription approach to selling their produce, marketing risks (such as reduced demand over holiday periods) and associated costs can be reduced, and enormous slabs of time saved. In our case, knowing exactly how many sheep need to be shorn and how many young cattle to have finished helps with forward planning. Why is a membership fee required to be part of the CSA? The membership fee allows Border Park Organics CSA to be sustainable. A new approach means a new operating system needs to be developed. We’ve had to commission our ever-patient website developer to build a membership component into our website. This has been a challenging and costly exercise, but we’re confident you’ll love the advantages that come with being a CSA member. CSA members receive a host of benefits, including freebies, special member pricing, exclusive products, a payment plan and invitation to attend a farm tour, just to name a few! Once you’ve completed your Order Sheet and paid your Membership fee, you can sit back and relax! Member’s orders will be home delivered (or to a central collection point) either 4 times a year (Option A) or 2 times a year (Option B). A monthly payment plan allows you to pay for your order over 8 months, either using either the Manual Payment Method (MPM) or the Automatic Payment Method (APM). Talk about convenience . . . one easy order and your family’s organic beef and lamb are organised for the whole year. See what the 5-step process involves here. What’s the difference between the 2 Membership Options, A and B? Option A will be delivered 4 times a year (May, July, September, November), and Option B will be delivered 2 times a year (June, October). The same meat packs are available to both. We’ve designed Option A for those who have larger families, have less freezer space, eat meat regularly or prefer to store their meat for short periods of time. Option B may suit those who wish to save money on freight costs, have smaller families, have more available freezer space or those who eat meat less frequently. What’s the difference between the 2 Payment Methods, MPM and APM? The Manual Payment Method (MPM) requires manual payment monthly via Direct Transfer or Paypal.Me (after you receive notification to pay). This notification will be sent to you on the 22nd of each month and we ask that you make payment no later than the 26th of the month. The CSA Membership for 2018 requires your order paid in eight (8) monthly payments. Your first payment will be due by 26 April 2018 and your eighth and final payment will be due on 26 November 2018. There is a 2% transaction fee when Paypal is used. The Automatic Payment Method (APM) allows an automatic monthly payment via eWay only. This payment will take place on the 26th of each month. For peace of mind and your records, you will receive notification once the payment clears. Again, the CSA Membership for 2018 requires your order paid in eight (8) monthly payments. Your first payment will be due on 26 April 2018 and your eighth and final payment will be due on 26 November 2018. There is a 2% transaction fee when eWay is used. Paypal.Me is a useful, quicklink to enable payments via Paypal. 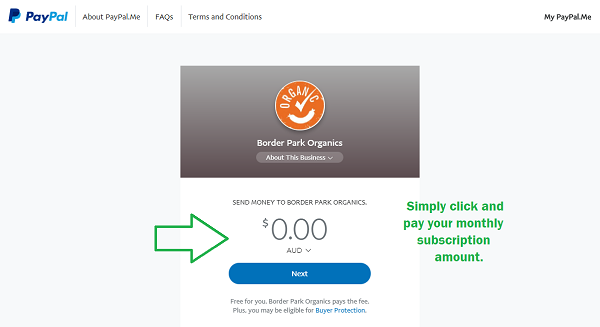 Border Park Organics now has a unique PayPal.Me link so that you can pay via Paypal without going through the website’s Cart-Checkout process. Simply add your amount and follow the prompts. This option is only available to CSA members, and specifically those who select the Manual Payment Method (MPM). How do I place a Member order? Download the Order Sheet and use the online CSA Member Product Menu as a guide to complete the Order Sheet. Return your completed Order Sheet via email by Wednesday 28th March 2018 and we’ll get back to you with confirmation of your order. At this point, we’ll ask you to pay the Membership Fee online, which secures your CSA share. Once your Membership Fee is paid, we then set up your membership subscription for 2018. So to be clear, while the Membership Fee is paid via the website’s Cart-Checkout process, a Member order is submitted via email when you return the completed Order Sheet. Our deliveries are made during business hours. Wherever possible, it’s best if you’re home so you can quickly get your order into the fridge or freezer. In the event you won’t be home, you can request your order to be left with a neighbour or at a workplace if this is more convenient. Alternatively, if absolutely necessary, you may leave an esky in a safe place and we’ll request the courier to transfer it for you (though we don’t recommend this in the warmer months). What if I’m going away on a delivery month? Once your order has been confirmed and your CSA membership fee paid, we will be able to give you an exact date and approximate time for each of your deliveries for the remainder of the year. This will help with forward planning. If you know in advance that you’ll be away on a delivery month, we ask that you find someone to collect your order on your behalf. Should you be away for an extended time, we may be able to suspend your share until your return – we need at least one month’s notice. Please contact us to confirm this is possible. Can I nominate my order delivery to a different address? You’re welcome to alter your delivery address or collection point. We do ask that you contact us at least 3 weeks prior to your scheduled delivery so we can notify the couriers. Why can’t I collect from Loxton Abattoir anymore? 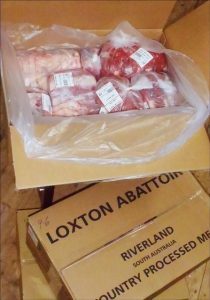 Our livestock will continue to be slaughtered by the team at Loxton Abattoir, but will be processed by a team of specialty butchers in Strathalbyn. All orders will be sent out from Strathalbyn and on-forwarded to customers. Residents living in the Loxton district will now have a freight charge for their orders. Find details of all our available collection points here. Why not continue selling meat directly to the public? Why go CSA? Although we will continue to sell meat directly to the public through our website, we’ve learnt a thing or two over the past few years. Firstly, we’ve discovered that time is a limited resource. (We’re sometimes slow learners!) We want to invest in meaningful relationships with those people who value what we do and what we produce. Taking this extra step in the direction of a solidarity economy will allow us to concentrate on farming and looking after our family (rather than the continual demands of marketing ourselves online). I don’t have a CSA member share. Can I still buy meat from you? Stock permitting, yes. We will still be opening orders for regular sales throughout the year. However, please be aware that at the beginning of the season, our CSA Members have first preferences of packs. Therefore, we anticipate there will be very few (if any) products left for sale on our website once our membership program closes on Wednesday 28th March 2018. Why can’t I request specific cuts in the member packs? The focus at Border Park Organics is on providing delicious, affordable, organic meat that can be enjoyed by all, including those on special food diets. While we could feature more gourmet, specialised cuts in our meat packs, these take our butchers longer to prepare. We’ve chosen to keep prices down and provide you with a range of cuts that will satisfy, but also expand your cooking skills. Why does my Half Lamb Pack weigh less/more than it did last time? Why did I receive hogget instead of lamb this month? Can I change my order part-way through the year? Changing your order after confirmation would be tricky for us as we’ve allocated a specific number of meat packs to our CSA Members to avoid over-selling or under-supply. If, however, you have a change in personal circumstances, please contact us as early as possible so we can make alternative arrangements with you. Please note that there will typically be a charge equivalent to one month of your membership should you withdraw your CSA subscription. While we are happy to negotiate should you need to cancel your subscription early due to personal circumstances, there will typically be a charge equivalent to one month of your membership should you cancel before your subscription is up. Why do I only receive an estimated cost for my order? The weights we suggest for each meat pack should only be used as a guide, and are based on average weights for our animals. It is difficult to state an exact weight as each animal is built differently with regards to muscling, fat and bone. Our 50% deposit is calculated using these average weights. Once your order has been processed and weighed, we reconcile this amount with your original estimated weight. Any difference owing is included in your final payment notice. We offer multiple options! We have nearly 60 collection points in South Australia (we also deliver to Mildura in Victoria and to several points in New South Wales). Your deposit may be made by secure online credit card, PayPal or bank transfer (EFT), and must be received by us within 7 days of you placing your order. What happens if I don't pay the deposit within 7 days? We request that you pay your deposit within 7 days of placing your order. If we don’t receive your deposit within this time frame and we have had no contact from you, your order will be deleted from our system. If for some reason you are not able to pay your deposit within 7 days, please contact us as soon as possible. We realise that extenuating circumstances occur, and where possible will do our best to assist. How do you work out my final payment amount? When your order is processed, it is weighed prior to packing. This weight is multiplied by the price per kilogram, which results in your total payment price. We then subtract your deposit amount from this total payment price, leaving your final payment amount. Can I still place an order if I miss the order deadline? This is difficult to say. Occasionally we have Meat Packs still available for purchase after the order deadline, but we cannot guarantee it. If you miss the order deadline and would still like to be considered for inclusion in the current order, please email us as soon as possible. Whenever possible, we will do our best to accommodate your request. Alternatively, our Calendar could provide other suitable options for upcoming orders. Your freight costs will be included in your initial invoice along with the deposit. Any savings on freight, when two or more customers use the same collection point, will be reduced from your final payment. You can read about how we handle freight here. There are no cash-on-collection options. Details of freight costs can be found on our interactive map here. How long will it take to receive my meat order? Orders are required at least 14 days prior to the collection date. Depending on when you place your order, please allow at least 21 – 28 days for your meat pack to be processed and ready for collection. You will be notified via email as your order progresses. How do I know when my meat order is due for collection? When you browse the products in our shop, the expected collection date will be clearly displayed. Please note this date carefully to make sure you, or someone you elect, can collect your meat order. We aim to supply our customers with a range of beef, lamb and combo meat packs to suit all tastes, seasons and family size. Please email us if you have a suggestion you would like us to consider. What do your meat packs contain? All the hard work of selecting meat cuts has been done for you! We have developed a number of different meat packs to make ordering quick and easy for customers. Each pack contains an assortment of pre-selected cuts such as roasts, steak, chops, diced meat and mince. Each meat pack contains a selection of cuts from both the hindquarter and forequarter of the animal. If you are still unsure about the best meat pack to select for your requirements, we would be happy to assist via email or phone. Which type of meat should I order? There is a plethora of information on the internet about beef and lamb cuts, the best way to cook them, and mouth-watering recipes that make you wish you’d defrosted your meat earlier! The suggestions below are more focused on the flavour, rather than specific cuts. • Our Yearling beef are aged up to approximately 18 months; Young Beef up to 2 ½ years and Mature Beef are at least 3 years old. • We tend to select the cuts of meat in our beef packs to best reflect the flavour and texture of the meat. Therefore, our Winter Value Beef Packs are sourced from our mature cattle, and consequently feature cuts of meat that benefit from slow, moist heat. • Our Lambs are aged up to approximately 12 months; Hoggets up to 2 years; and Mutton are at least 2 years old. • Lamb is to mutton what veal is to beef, so young mutton is more deeply flavoured and benefits from hanging and dry-ageing. • The general rule of thumb is that the older the animal, the more flavourful the meat becomes. For example: if you like a subtle meat flavour, then lamb is probably the best selection; if you like meat that is richer and well-flavoured, then hogget or mutton are possibly best. If you need any more advice, please don’t hesitate to email us. We enjoy personalising our service to you, and ensuring you’re confident in preparing the meat we’ve carefully grown for you. What is unique about your organic meat? Our lambs and calves are born at the end of Autumn so that the mothers have green feed to eat during lactation, and the best pasture is available for their offspring in early Spring when they are old enough to graze. This means there is only one drop of lambs and calves born each year, and not all year round. Due to the timing of lambing and calving as well as seasonal variations, it is not always possible to offer our customers the full range of sheep or beef. When this occurs, we will suggest an alternative aged animal. The total weight of your order will vary with seasonal conditions, natural variations in the body weights of the animals and the age of the animal. You may notice that our meat has a darker red colour, a firmer texture and a whiter fat than that of non-organic origin. Typically, customers also report that our meat has a ‘real meat’ flavour that they remember from their childhood – a reminder that one is actually eating beef or lamb! Do I have to have all the different cuts in the pack I choose? Yes, you get all the cuts listed in the pack you choose. You cannot pick and choose which cuts you want from different packs. Under special circumstances there is some choice in the butchering and processing methods. For example, some customers want the silverside roasts corned while others prefer these left as fresh roasts. Please make a note of these requests in the “Special Instructions” box at the bottom of the ordering page. Why have you named your meat packs such unusual names? We love living in the South Australia’s Northern Mallee region. Although we originally grew up in North Western NSW, we feel incredibly blessed to have the opportunity to call a new part of Australia ‘home’. The names of our Beef Packs are taken from small villages and localities in a 20km radius from our farm. These villages were linked via the railway line that was opened in 1913, which saw the land open up and develop. Our Combo Packs have been titled to reflect some of the occupations of people in this area when it was settled early in the 1900s. Our Winter Value Beef Packs are named after some of the different types of Mallee trees that we have on our farm. The names are reflective of the coloured tinges of the mallees – blue, red and white. We hope that the Pack names that we’ve chosen will entice you to visit our humble area one day, and to see the beauty of God’s creation here! How long will my meat pack last my family? This is quite difficult to answer accurately without taking into consideration meat portion size, appetites and your style of cooking. Can I order sausages with my meat order? We have four types of sausages: Gourmet Organic BBQ, Organic Hearty Beef sausages, Organic Honey Mustard Lamb sausages and Organic Minted Lamb sausages (all gluten and preservative free). The cost for sausages is $13.95/kg. Do you sell organ meats, fat and bones? The price for organ meats is $5/kg. All of our organ meats are chilled and cryovaked immediately after slaughter. Cryovac packaging removes most of the air around the meat, prevents oxidation, and gives meat longer shelf life in the fridge or freezer. Organ meats such as liver, kidneys, heart and tongue available from our lambs and yearling/ young beef. We also have Beef Oxtail and Beef Cheeks for $14.95/kg, available in limited quantities. Our Certified Organic Organ Meats are very popular with our customers. As our organ meats are only available in limited quantities, this often leads to demand exceeding supply. We will do our very best to fill your order, and we will let you know prior to collection if we are not able to. Thanks in advance for your understanding. If you require Organ Meats, please order them from “The Good Stuff” section of our website. The price for beef suet is $2/kg per large pack (approx 5kg), or $2.50/kg for a small pack (approx 2kg). The price for lamb suet is $3 per pack (approx 1kg). Suet refers to the fat from beef or lamb, with the epitome being the ‘leaf fat’ or the hard-internal fat found around the kidneys and loins. This type of suet is ideal because it is the cleanest and has little to no flavour (which is important if you want it for baking purposes!). Suet is higher in saturated fats than other beef fat, making it ideal for a number of culinary uses. Suet can be used for roasting, rendering, baking, soap-making or other purposes. Rendered suet is referred to as tallow (beef) or lard (lamb), when it is melted, simmered for an extended time, strained and cooled. Tallow or lard is relatively mild in flavour and can be used interchangeably where you would use butter. It is also ideal for deep frying because of its high smoke point, and is particularly impressive for browning meat for casseroles or curries. When fully rendered, tallow does not require refrigeration. The price for beef bones is $1.50/kg per large box (approx 12kg), $2.00/kg per small box (approx 5kg) or beef marrow bones per small pack is $5/kg (approx 3kg). Lamb bones are $1.50/kg per large box (approx 8kg). If you require beef bones for making beef stock, soups or to feed dogs, please order them from “The Good Stuff” section of our website. A selection of different meaty bones (marrow, rib, neck, and knuckle bones) will be included. Where possible, all marrow bones will be sliced lengthways to allow for easy roasting and eating. Can I request the organ meats from my young mutton, mutton or mature beef? Unfortunately, not. We realise the tremendous health benefits of consuming these organs, but legally we are not able to provide customers with these products. We are only permitted to provide organ meats from Lambs and some Hoggets (ie. up to approx 18 months) and Young Cattle (ie. up to 30 months). All prices are charged per kg box weight (ie. the actual amount of meat you receive). Our bulk prices for organic meat are very reasonable. Depending on the timing of your order, some ages may not always be available. * Yearling Beef available only on special request and subject to availability. ** Depending on availability, we aim to provide our customers with Beef. However, due to seasonal variations we may offer Young Yearling Beef as an alternative. ***50% of this total is required as a deposit to accept your order. How can I benefit from buying meat in bulk? • Price – a flat overall price per kg for every cut of meat (from eye fillet steak or porterhouse to mince and diced steak). • Convenience – less trips to the supermarket or butcher to purchase meat. Simply look in your freezer for inspiration for your next meal. • Versatility – having access to different cuts of meat you may not have previously tried or been able to afford. Now you can try that delicious new recipe knowing you have that ‘cut’ on hand. • Health – providing organic, pasture-fed meat for your family. This includes having access to organ meats, bones and suet. The majority of online retailers now require a full payment upfront before you receive the product. A full payment is difficult to do in our circumstances due to variations in weights of our animals. By paying a deposit, we are assured that customers are committed to their meat order purchase, which in turns helps us accurately determine how many meat packs we still have available for sale. The deposit you have paid to secure your order will be deducted from your total price when you receive your final email invoice. If for some reason you are not able to pay your deposit within 7 days, please contact us as soon as possible. We realise that extenuating circumstances happen, and will try our best to assist. There are no cash-on-collection options. Your freight costs are due at the time of placing your order, and will be included as part of your required deposit amount. If you are eligible for any reduction in freight costs (due to sharing a collection point with other customers), this refund will be applied to your final invoice. Details of freight costs can be found on our interactive map here. How is my meat handled? We personally deliver our animals to our local award-winning abattoir (Loxton Abattoir), which is 50km from the farm. This means fewer ‘food miles’ for your meat and less stress on our animals. Our stock typically leave our farm on Wednesday afternoon and are slaughtered early on Thursday morning after resting in the yards overnight. Our animals are housed and slaughtered strictly in line with Australian Organic Standards; ie. without any chemical being used in any stage of the operation, and a designated area for organic livestock and meat. Careful documentation from our farming perspective and on the part of the Abattoir and butchers enables a fully traceable audit trail from the birth of an animal until it reaches our customers. The Abattoir hang the carcasses for 6 – 14 days at a temperature between 1- 3°C. This method of hanging and ageing meat for several days after slaughter is the traditional way of tenderising and improving the flavour of meat. The carcasses are then transported by refrigerated courier to a butcher in Strathalbyn where they are processed and boxed up ready for delivery to customers. The Loxton Abattoir is a family owned business and is operated by Chris and Michele Schwarz. It is a fully certified organic processing facility with NASAA. We are so fortunate to have a certified organic abattoir located very close to our farm, and are very thankful for the work of Chris and Michele Schwarz and their team. • In 1998, Loxton Abattoir became the first certified organic abattoir in South Australia. • In 2013, Loxton Abattoir was placed 3rd in South Australia for their mouth-watering sausages. * Long-distance customers: In order to serve outlying areas and to keep goods as fresh as possible, we bulk vacuum pack all meat cuts and sausages, and freeze bones and organ meats. A small packaging fee of approximately $15 will be added to the final invoices for each long-distance customer. Why isn’t your meat vacuum packed and/or portioned? Depending on the size of the vacuum bag, it can take an extra few minutes to seal each bag rather than taping a freezer bag shut. While this doesn’t sound like much, packaging orders for 25+ customers mean these extra minutes add up for the butchering team. And extra labour costs means a higher processing fee. We’d rather save you this extra expense, and allow you to portion your meat for your family’s needs. Would you like your meat vacuum packed? You may choose to have all the cuts in your meat pack vacuum (cryovac) packaged at an additional cost of $2.50/kg. The only products that are unable to be cryovaked are our sausages. If you require this option, please get in touch with us before placing your order. We will be advise whether or not there is adequate time on the day of processing to accommodate your request. If it is possible, please note your need for vacuum packing in the ‘Special Instructions’ section at checkout. This additional cost will be added to your final invoice when your meat is weighed and packed. How many boxes of meat should I expect? The Abattoir has two different sized boxes available to pack orders into, depending on the amount of meat you have purchased. We strive to minimise the number of boxes customers receive for helping keep freight costs down (some companies charge freight per box) and to reduce packaging. Small packs and mince packed in 1 small box; 1/8 beef packed in 1 box. ½ lamb or whole lamb packed in 1 box. Small and medium packed in 1 box. Small and medium packed in 1 box; large packed in 2 boxes. How much freezer space will I require? Following is a table giving a visual comparison between the amount of meat you receive, and the amount of space needed for standard loaves of bread. How long should I store my meat? Once you have received it, the majority of your meat will store for 2-3 days in the fridge. Please be aware that as our sausages and mince contain no preservatives, they should be eaten straight away, or frozen for later use. Our bones are highly perishable, and should be stored for no longer than 2 days in the fridge (and only a day for marrow bones) before cooking and freezing. For longer-term storage of your meat, simply freeze and use it within 4- 6 months. Our organ meats are typically cryovaked, we suggest that you use them immediately or freeze them. 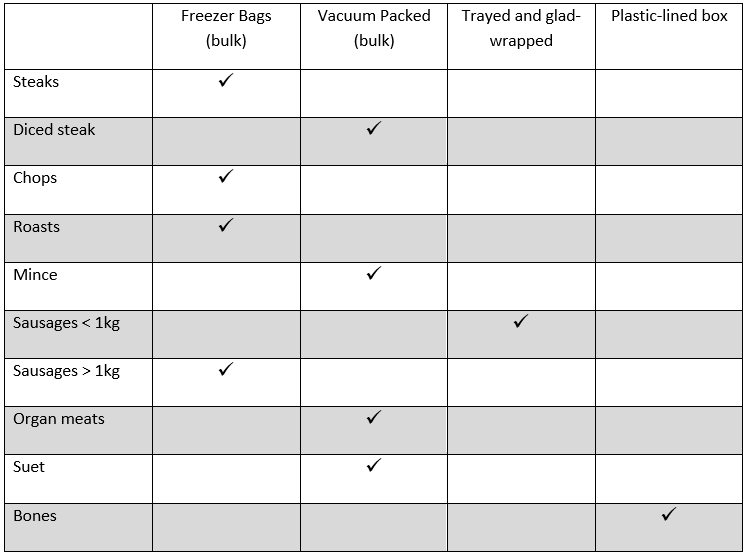 What is cryovak / vacuum packaging? Cryovaking provides a convenient, practical way of storing meat in your fridge or freezer. It allows a longer fridge or freezer life, protects meat from bacteria and dehydration, prevents ‘freezer burn’ and leakage when defrosting. Please note that when meat has been cryovaked, the confinement odour will dissipate once the meat is exposed and the packaging discarded. This odour is a natural occurrence of the meat ageing process and isn’t harmful. Once you open the cryovak bag, the meat should be consumed within 2 – 3 days or cooked. If you require your meat to be cryovac packed into smaller amounts, please note this in the ‘Special Instructions’ box on the order page. Due to the need for specialised equipment, bags and extra time, this will attract an additional fee of $2.20/kg. This price will added to your final invoice once your order has been weighed and packed. What are some tips for storing my meat? Once you have received your bulk order, you can then re-pack steaks and mince onto trays or in bags in convenient amounts and freeze it. This packing process does take time, so ensure you can set aside at least ½ hour to do this. From our own experience, we have found it helpful to layer several sheets of newspaper between trays or bags of meat when you place them in the freezer. This prevents the meat all freezing together in blocks, and from having to defrost lots of meat at once! Once you have frozen your meat, we suggest you store meats together that have similar cooking methods in a cloth bag or old pillowcase. That way it is easier to lift out and find what you want! Don’t forget to attach a list to your freezer door detailing the contents of your ‘meat bags’. For example: bag 1 contains mince and sausages, bag 2 contains roasts, bag 3 contains diced meat and gravy beef, etc. What livestock do you farm? • Our cattle are poll Herefords, which are born and raised solely on the farm. These red and white cattle are a very old British breed that have been prominent in Australia’s pastoral history. Herefords have been bred on Border Park by John and Jenny Schwarz for 25-30 years. • Our Herefords are bred for their quiet nature, their capacity to finish well on pasture, and for their ability to hold ‘condition’ while rearing a good calf. • We source our bulls from ‘Oak Downs’ at Bordertown. • We only have a small herd of breeder cows and their numbers vary depending on rainfall and pasture growth. Annually, we have about 20 young cattle available for meat sales. • Our sheep are poll Merinos, bred both for their meat and medium-fine wool. They are born and raised solely on the farm. • We use rams from various studs including Leahcims (from Snowtown, SA), known for their excellent wool, and Calcookara (from Cowell, SA) known for their bare breech sheep. • One of our breeding objectives for our flock is the bare breech. Our aim is to have sheep with naturally bare skin around and below the tail area, which would mean minimal intervention for their wellbeing. • We run approximately 340 breeder ewes. How are your animals fed? We have chosen to label our animals as ‘Pasture-fed’ rather than ‘Grass-fed’ because they graze freely in our paddocks on the available plants that grow. Due to the marginal location of our farm and the low rainfall we receive, we often cannot grow year-round ‘green’ grass. (See here for the benefits of eating grass-fed meat). Due to careful breeding and selection, our animals are naturally acclimatised to our hot, dry climate and resulting pasture, and are able to thrive in a marginal area. What is a certified organic farm? Organic Certification requires all certified Primary Producers have an approved Organic Management Plan as a guideline for their farming operations. They are required to keep detailed information relating to allowable inputs, stock movements, crop rotations, weed management tools, soil health tests, and much more. Primary Producers are audited annually by an Inspector, who completes a farm tour and reviews farm records. Issues such as contamination risks, chemical residue testing and wildlife risks are all discussed where appropriate. You can view the National Standard for Organic and Bio-Dynamic Produce by which we base our farming principles here. You will find a very readable explanation about what Certified Organic is here, and an outline of the difference between Organic and Conventional farming here. What is your commitment to organics? Our shared, personal conviction of the need to provide quality nutrition for our children has complimented our commitment to organic farming as a way of life. (See here for the health benefits of eating organic meat). We believe that we should treat others as we would want to be treated, and that our regard for other people’s wellbeing should go beyond merely not causing harm, but extend to giving and helping as we are able. In this context, the idea of using potentially harmful chemicals to produce food in order to increase our financial profit just doesn’t make sense. Thankfully, others have the same conviction. They are looking for food produced without the use of harmful substances and grown in healthy, natural systems. These people need to be sure of the integrity of the food they are purchasing, and organic certification is a way of providing them with that assurance. Although we hold a strong commitment to farming the way we do, we don’t pass judgement or press our convictions on farmers who choose to use chemical products in their farming systems. How can I be confident your livestock are raised under certified organic standards? Careful documentation from our farming perspective and on the part of the Abattoir and butcher enables a fully traceable audit trail from the birth of an animal until it reaches our customers. Our management techniques, production systems and farmland are inspected annually by The National Association for Sustainable Agriculture, Australia (NASAA) personnel to ensure they comply with the standard for organic produce. Our activity is then certified under the NASAA label and we are issued with a certificate and certification number. The details of our business are also listed on the NASAA website and linked to the NASAA Facebook page. By providing our customers with our certification number, we provide assurance of production under Australian standards. Our current Certified Organic Certificate of Registration (NCO 5442) is available on request, and features over 15 products for which we are certified. The Loxton Abattoir who slaughters all our meat is also fully certified organic with NASAA (NCO 5138P). Please note that the butchers who process our meat are not currently certified organic. How long has 'Border Park' been certified organic? John and Jenny have been on the Organic path for over 20 years. They began in the early 1990s when the term ‘organic’ food was seldom heard, let alone practised. As owners of ‘Border Park’, John and Jenny made the visionary, God-inspired decision to organically certify their cropping enterprise through NASAA in 1996. This was followed in 1998 by the additional full Organic Certification of their livestock – beef cattle, merino sheep and wool. The McIntosh family count it as a blessing to be able to continue the initiative shown by John and Jenny Schwarz and maintain the farm as an Organic enterprise. Josh and Peri McIntosh trading as ‘Border Park Organics’ have been certified organic primary producers with the National Association for Sustainable Agriculture, Australia (NASAA) and certified with Korean Organic requirements since 2014. How do you maintain your soil fertility? While there is great variation in the soil types across the farm, the majority of our soils are sandy loam. Natural minerals such as gypsum, dolomite and basalt sand are spread on some paddocks at very low rates to correct mineral deficiencies as indicated by annual soil tests. We maintain our topsoil fertility by following a three year rotation for grain crops and by turning in plant matter before seeding. Legumes growing in the pasture phase provide nitrogen and controlled grazing of our sheep and cattle helps promote nutrient cycling. Our sandy loam soil is generally quite ‘light’, and for this reason we only work our ground after rain. We believe our soil is a valuable asset that we’ve been blessed with, and for this reason it is our obligation to nurture it for future generations. How is healthy soil related to my meat? In March 2014, there was a thought-provoking article written by the people who founded an online shop focusing on providing customers transparency about the growing process of the food they sell. What was particularly interesting was their statement “What you’re actually eating isn’t cow, it’s soil”. What a mind-boggling thought, but how true this is. Healthy food comes from healthy soil. It is the rainfall that provides the means for plant growth, which in turn transfers nutrition from the soil to the animal consuming the plant. In times of low rainfall and slow plant growth, it takes more time for an animal to gain the nutrition it needs to be ready for sale. We are meeting this challenge by careful management of pastures and fodder shrubs so that our livestock can access nutrition even during the drier periods. What are the benefits of buying organic meat? This is in line with the requirements of being a Certified Organic Producer. What are the benefits of eating grass-fed meat? There is growing evidence to suggest that returning to the animal husbandry methods of our grandparents and great-grandparents may be best for our health and the environment. Numerous studies have been done on the benefit of eating Grass-fed Beef. Other differences to note are that grass-fed animals grow more slowly and expend more energy walking in search of food and require less feed weight ratio per head to add muscle. As our Hereford cattle and Merino sheep graze on many different grasses in our paddocks, you may notice a subtle variation in the flavour of beef or lamb than you are used to. For a comprehensive discussion on the many benefits, see Health Benefits of Grass-fed Products and The Truth about Grassfed Beef. Is your meat suitable for use on a Paleo, GAPS or SCD diet? For those on ‘grain-restrictive’ diets, we also make 3 different types of sausages (hearty beef, honey mustard lamb and minted lamb). They don’t contain gluten, grains, dairy or preservatives. As Chris Kresser from Let’s Take Back your Health states, “While organ meats have gotten a little more attention in the Paleo community recently, many people still don’t quite appreciate how vital it is to include these nutritional powerhouses in their regular diet. Plus, knowing we should be eating offal and actually eating these foods are two very different things”. See his article on How to Eat More Organ Meats for a fascinating, motivating read!